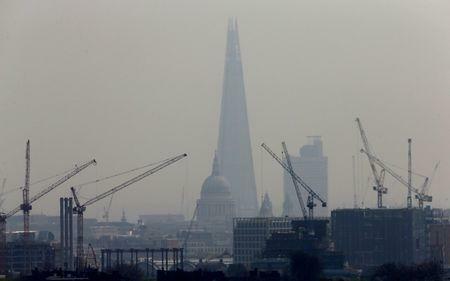 LONDON (Reuters) - Britain's greenhouse gas (GHG) emissions fell by 3 percent last year from 2016 levels, largely due to a decline in coal-fired power generation and marking the fifth straight yearly drop, preliminary government data showed on Thursday. Earlier this month, it also rejected plans for a new open cast coal mine in northeastern England on climate grounds. Gas-fired power generation fell almost 6 percent in 2017, while renewable power generation from wind and solar soared, the data showed. Wind power rose 33 percent to a record 40.9 TWh while solar generation was up 43 percent to a record 2.9 TWh.